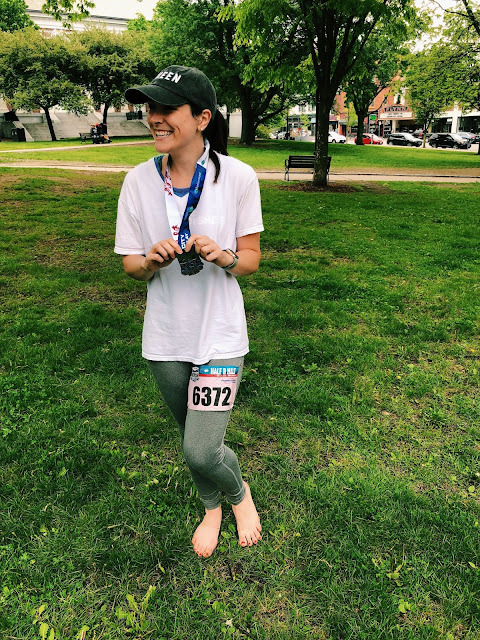 This weekend I finished my fourth half marathon in three years. How is that I real sentence that I can type? I do not know. I can't say that three years ago I would have expected to be a distance runner today. I can't even say that I consider myself a distance runner today. But I've run four half marathons. And there is something really spectacular that happens when you look at that as a whole, and you look at who I was when the gun went off on my first race, and who I am now that I've crossed another finish line. I think no matter what length you run, a race brings about a certain level of reflection and...well, feelings. I have felt just about every feeling under the sun while running. Especially while running 13.1 miles. I've been elated, pissed, disappointed, hopeful, and totally lost in thought. I've been focused on my own race, and focused on every soul around me. I've wanted to quit - for sure when I broke my dang foot - and I've wanted to keep going. Running races is not something I was even capable of three plus years ago. And now, I enjoy it. Actually I totally love it. But totally loving running didn't come easily, and it is not constant. Usually it happens pre-race, but typically it also happens during the race, that I entertain the idea of never running again. I often think that I've made the worst decision ever by signing up for yet another race, and that's usually the morning of the race. But low and behold, whether it's a 3 mile race, or a 13 mile race, that last .1 is unlike anything else. I mean, I've been on big stages, I've traveled to cool places, I've done some decently amazing things. Still, there is nothing like crossing the finish line. I would be lying if I said that running came easily to me. Each race I run involves some level of fight. Some level of literally pushing as many limits as I have. Physical, mental, you name it. All that being said, my most recent half was my best race, literally ever. I have never felt so capable, so ready, and so good while running. I was beautifully paced. So much so, guys, that I nearly missed my dad and Doctor Roommate at the 10 mile marker. Because I was so fast. Kid ya not. I was well-fueled. I was in maybe the best zone I've ever been in. And I ran happy. I ran strong. I ran knowing that I wanted to be there. And I knew by about mile 11 that I was going to PR. I knew even if I slowed down dramatically, I had run my best race ever. So I grabbed the icee pops, and the oranges, and threw out a couple high fives and finished strong. The finish line? Not at all like a finish line that I've crossed before. Because actually, it was a transfer point. For those that don't know, to run the Vermont City Marathon as a half, you have to be part of team. There are 2, 3, and 5 person relays. I was on the first half of a 2 person relay team. But because the other half of my team wasn't running, all I had to do was cross that line - no pressure, no transfer, just joy. It was...quiet. And the people on the sidelines were not cheering, but anxiously bouncing, waiting to start their race. And still, I felt so damn proud that I had just run the best race of my life. And still...I'm taking a break from half marathons. Just for now. Just so I can take some time to not feel any pressure to hit a certain level of mileage each week. Just so I can go back to running a few miles here and there, and feeling satisfied. I'll likely still run races, and probably run another half eventually. 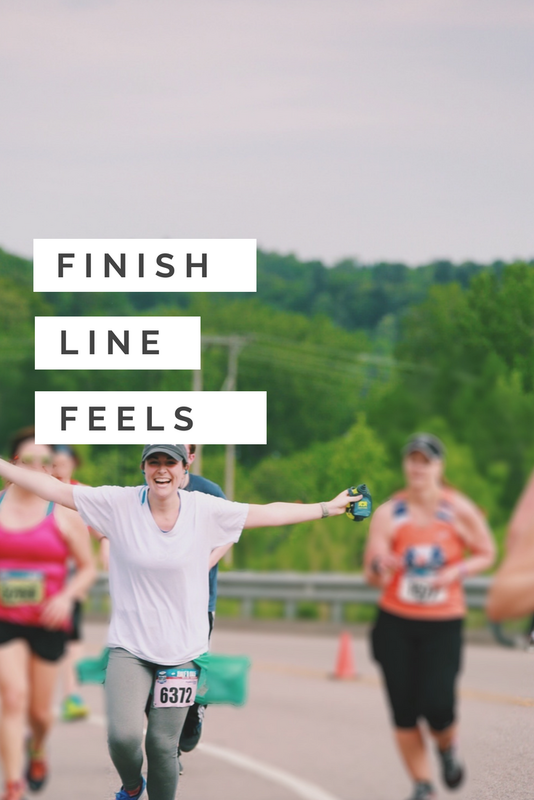 Because really, nothing compares to those finish line feels.